We are a group of passionate farmers, growing hens in a traditional backyard method with a mission to provide 100% natural & healthy eggs and chicken meat. Our Hens are humanely raised and naturally fed to lay healthier and tastier eggs enriched with organic vitamins and minerals. Cooking eggs has never been easier. Get back to basics with step-by-step lessons on all the different ways to cook eggs. From hard-boiled and scrambled to perfectly poached, lessons on how to cook eggs start here. Master the techniques and get ready to enjoy endless ways to eat eggs. 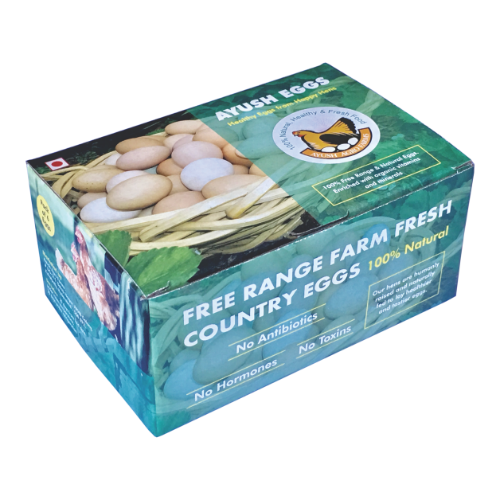 See how we Produce, Source, Package and bring Ayush Free Range Eggs to your table. Improves quality of breast milk. Nutrients that present in our eggs enter mothers milk and help brain cell development, liver function of the infant. 01. Why Ayush eggs cost more than other eggs in market? Our free range hens produce less number of eggs per year when compared to commercial breeds. In free range farm practice the birds engage in natural behaviour & burn a considerable energy in their day do day activity. Hence we feed them more when compared to commercial breeds. A lot of effort both in financial & labour, goes to maintain the green pasture's for our hens in the range. Its evident on our strong, upright orange YOLK. 02. What do Ayush hens feed on? Hens in our farm feed on grains, fresh greens, herbs & others formulated in house to achieve a balanced healthy diet. Our feed is natural, no animal by product is fed to our birds. Feed is free from antibiotics, hormones, toxic & synthetic supplements. In addition they indulge in natural scavenging activity in the range and feed on highly nutritious greens, seeds, bugs & other sources which makes them physically healthy & happy as a Ayush Hen. 03. What is the difference between caged, cage-free, free range and pasture raised farming? Caged means hens are kept in tightly packed wired cages their whole life and denied all their freedom. Unable even to spread their wings and turn around, caged hens are deprived to express & engage in all natural behaviours. Its unethical & inhumane standards. Cage Free / Barn System means hens live in a confined area i.e. between four walls. They are provided nest box to lay eggs. They have limited space to fly within the pen & express few natural behaviours. Free-range means cage-free plus a little access to the outdoors. Pasture-raised birds spend most of their life outdoors, with a fair amount of space plus access to a barn to roam freely to express all their natural behaviour & a pen for night shelter & nest to lay eggs in privacy. Fresh air, bright & pleasant sun shine & lots of exercise to keep them fit & healthy.Many are able to eat a diet of worms, insects and grass, along with corn feed. Similarly at Ayush agro farms our we grow our hens in both cage free and free range based pasture-raised farming. 04. What does hormone free and antibiotic free eggs mean? No hormones is used to advance or increase the egg production & weight of the bird. 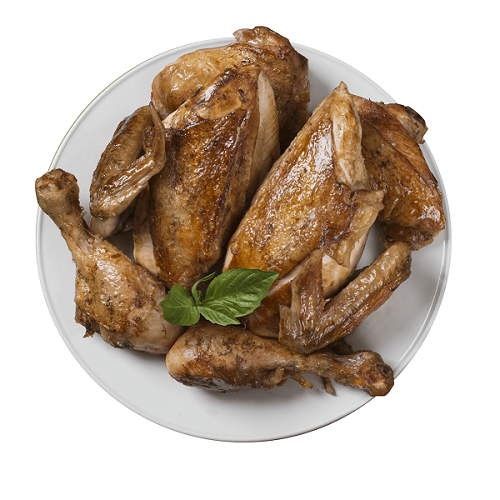 While anti-biotic free means birds diet is free from non therapeutic anti-biotics. 05. Why does egg shell colour vary and does egg quality vary with the colour of the shell? Colour changes in egg shell are due to the pigments called porphyrins being deposited while the eggs are in the process of formation. The process of colour change holds relevance to the breed of a bird which means colour change is natural. Additionally, shell colour has nothing to do with egg quality, flavour, nutritive value, or cooking characteristics. Ayush Agro farms egg shells colour varies from tan to dark brown occasionally white. 06. Why do eggs yolk color vary? Does yolk color affect egg nutritional quality? The carotenoids in the hen’s feed make the yolks yellow. They are found throughout the natural world, in plants, fruits and vegetables. The greater the quantity of these colorful substances in the hen’s diet, the stronger the shade of the yolk is. The hen ingests yellow pigments in corn or grass for a golden yolk. While the yolk color is not an indicator of nutritive value but definitely a golden upright yolk signifies good quality eggs. 07. Why does blood spots occurs in eggs? Blood spots occur when blood or a bit of tissue is released along with yolk. Each developing yolk in a hens ovary is enclosed in a sack containing blood vessels that supply yolk building substances. When the yolk is mature, it is normally released from the only area of the yolk sac, called the Stigma or suture line, that is free of blood vessels. Occasionally, the yolk sac ruptures at some other point, causing blood vessels to break and blood to appear on the yolk or in the white. Blood spots occur in less than one percent of all eggs laid. Blood spots may be triggered by too little vitamin A in a hens diet, or they may be hereditary. 08. What is the difference between fertile & infertile eggs? The difference is weather a rooster is involved or not in egg production. Hens do not need a rooster to lay eggs. Hens ovulate regularly. Such eggs are infertile. However, when a hen mates with a rooster, the eggs produced are fertile and under right incubation can bear chicks. There is no nutritional difference between fertile & infertile eggs. 09. How should I store eggs to keep them fresh? Keep them refrigerated and only take them out about 30 minutes before you will use them. Eggs can absorb flavours and odours so keep them in their cartons, pointed end down. And avoid washing them until they are ready to be used. 10. Why does egg shell colour vary? Egg shell colour variations are natural. The colour variations in the egg shell are due to the deposition of pignment called porphyrins during formation of the egg. Shell colour has no effect of the egg quality , flovour and nutritional value. Ayush eggs shell colour varies from tan to dark brown. 11. Why does the colour rub off some brown eggs when boiled? are they dyed? No the eggs are not dyed! its the work of our beautiful hens. This comes down to some basic science. The egg shell is composed of mainly of calcium carbonate, which is white. Brown egg shells contain the pigment protoporhyrin IX (a by product of hemoglobin) which is found only on the surface of the shell. Brown pigment is applied during the formation of the last layer of the egg, the bloom or cuticle. In some eggs the brown pigment can be rubbed off, as soon as it laid. some brown eggs might lose some colour during boiling aswell. Its normal in brown eggs. Nothing to worry. Its 100% safe to consume.